Source: the litany section of the U.S. Book of Common Prayer, 1928 edition. Matthew Henry's on "Our Father"
Adam Clarke's on "Our Father"
Albert Barnes on "Our Father"
[Our Father] It was a maxim of the Jews, that a man should not pray alone, but join with the Church; by which they particularly meant that he should, whether alone or with the synagogue, use the plural number as comprehending all the followers of God. 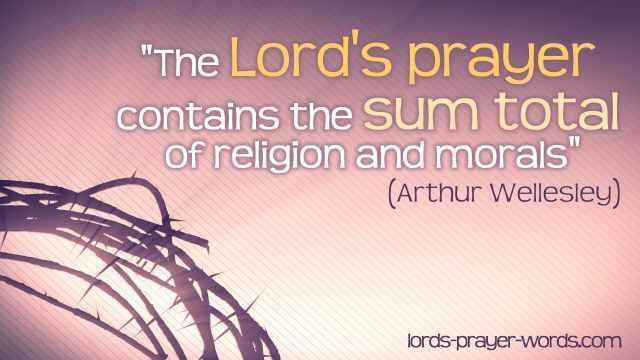 Hence, they say, Let none pray the short prayer, i.e. as the gloss expounds it, the prayer in the singular, but in the plural number. See Lightfoot on this place. This prayer was evidently made in a peculiar manner for the children of God. And hence we are taught to say, not MY Father, but OUR Father. The heart, says one, of a child of God, is a brotherly heart, in respect of all other Christians: it asks nothing but in the spirit of unity, fellowship, and Christian charity; desiring that for its brethren which it desires for itself. The word Father, placed here at the beginning of this prayer, includes two grand ideas, which should serve as a foundation to all our petitions: 1st. That tender and respectful love which we should feel for God, such as that which children feel for their fathers. 2dly. That strong confidence in God's love to us, such as fathers have for their children. Thus all the petitions in this prayer stand in strictest reference to the word Father; the first three referring to the love we have for God; and the three last, to that confidence which we have in the love he bears to us. The relation we stand in to this first and best of beings dictates to us reverence for his person, zeal for his honour, obedience to his will, submission to his dispensations and chastisements, and resemblance to his nature. Which art in heaven] The phrase , abinu sheboshemayim, our Father who art in heaven, was very common among the ancient Jews; and was used by them precisely in the same sense as it is used here by our Lord. 1st. His OMNIPRESENCE. The heaven of heavens cannot contain thee. 1Ki 8:27: that is, Thou fillest immensity. 2dly. His MAJESTY and DOMINION over his creatures. Art thou not God in heaven, and rulest thou not over all the kingdoms of the heathen? 2Ch 20:6. 3dly. His POWER and MIGHT. Art thou not God in heaven, and in thy hand is there not power and might, so that no creature is able to withstand thee! 2Ch 20:6. Our God is in heaven, and hath done whatsoever he pleased. Ps 115:3. 4thly. His OMNISCIENCE. The Lord's throne is in heaven, his eyes behold, his eye-lids try the children of men. Ps 11:4. The Lord looketh down from heaven, he beholdeth all the sons of men. Ps 33:13-15. 5thly. His infinite PURITY and HOLINESS. Look down from thy holy habitation, . De 26:15. Thou art the high and lofty One, who inhabiteth eternity, whose name is holy. Isa 57:15. Matthew Henry on "Our Father"
1. We must address ourselves to him as our Father, and must call him so. He is a common Father to all mankind by creation, Mal 2:10,Ac 17:28. He is in a special manner a Father to the saints, by adoption and regeneration (Eph 1:5,Ga 4:6); and an unspeakable privilege it is. Thus we must eye him in prayer, keep up good thoughts of him, such as are encouraging and not affrighting; nothing more pleasing to God, nor pleasant to ourselves, than to call God Father. Christ in prayer mostly called God Father. If he be our Father, he will pity us under our weaknesses and infirmities (Ps 103:13), will spare us (Mal 3:17), will make the best of our performances, though very defective, will deny us nothing that is good for us, Lu 11:11-13. We have access with boldness to him, as to a father, and have an advocate with the Father, and the Spirit of adoption. When we come repenting of our sins, we must eye God as a Father, as the prodigal did (Lu 15:18,Jer 3:19); when we come begging for grace, and peace, and the inheritance and blessing of sons, it is an encouragement that we come to God, not as an unreconciled, avenging Judge, but as a loving, gracious, reconciled Father in Christ, Jer 3:4. 2. As our Father in heaven: so in heaven as to be every where else, for the heaven cannot contain him; yet so in heaven as there to manifest his glory, for it is his throne (Ps 103:19), and it is to believers a throne of grace: thitherward we must direct our prayers, for Christ the Mediator is now in heaven, Heb 8:1. Heaven is out of sight, and a world of spirits, therefore our converse with God in prayer must be spiritual; it is on high, therefore in prayer we must be raised above the world, and lift up our hearts, Ps 5:1. Heaven is a place of perfect purity, and we must therefore lift up pure hands, must study to sanctify his name, who is the Holy One, and dwells in that holy place, Le 10:3. From heaven God beholds the children of men, Ps 33:13,14. And we must in prayer see his eye upon us: thence he has a full and clear view of all our wants and burdens and desires, and all our infirmities. It is the firmament of his power likewise, as well as of his prospect, Ps 150:1. He is not only, as a Father, able to help us, able to do great things for us, more than we can ask or think; he has wherewith to supply our needs, for every good gift is from above. He is a Father, and therefore we may come to him with boldness, but a Father in heaven, and therefore we must come with reverence, Ec 5:2. Thus all our prayers should correspond with that which is our great aim as Christians, and that is, to be with God in heaven. God and heaven, the end of our whole conversation, must be particularly eyed in every prayer; there is the centre to which we are all tending. By prayer, we send before us thither, where we profess to be going. Next: "Hallowed Be Thy Name"
Keith Warren explores the extraordinary revelation that God is "Our Father", and what this shows us about prayer. There is both a vertical and horizontal relationship to this prayer. Vertically - we are to understand God as our loving parent, and horizontally - God is "our" Father - not just "my" Father, and so it is that this prayer connects us with other believers across the world and through history. View from about 8 minutes in for his explanation of "Our Father in Heaven". (1.) as he is the Creator and the Great Parent of all. (2.) The Preserver of the human family, and the Provider for their wants, Mt 5:45, 6:32. (3.) In a peculiar sense the Father of those who are adopted into his family, who put confidence in him, who are true followers of Christ, and made heirs of life, Rom 8:14-17. 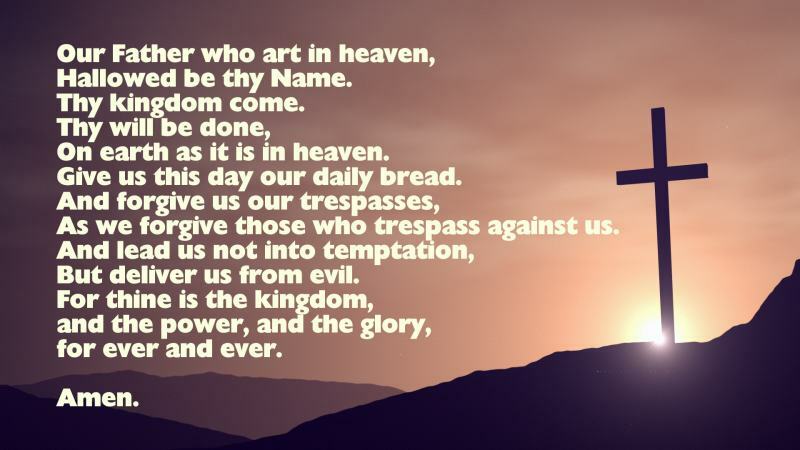 The lord's prayer in the KJV (Authorised) version, as it occurs in Matthew's Gospel. The words to the "Our Father" in Spanish. reviews of various versions of the Lord's prayer including the song by Cliff Richard "Millennium Prayer" and the famous setting by Albert Malotte. exploring the meaning of the word "hallowed" through the work of the famous biblical scholars Matthew Henry, Adam Clarke and Albert Barnes. Exploring the meaning of "Our Father who art in heaven" in greater detail with bible studies, sermons and commentaries, featuring the writings of John Calvin and Charles Spurgeon.